No Blogging for Old Men: The Small Screen: The Young Pope "Episode 3"
- This show is expertly scripted, such perfect dialogue in every scene. - Jude Law remains perfect for the lead role. I highly doubt that will change. He is a captivating and chilling bad guy, and make no mistake, this pope is the villain. - One of my favorite aspects of this series after three episodes is the fact that I both feel like I know where it is headed but really have no idea at all. 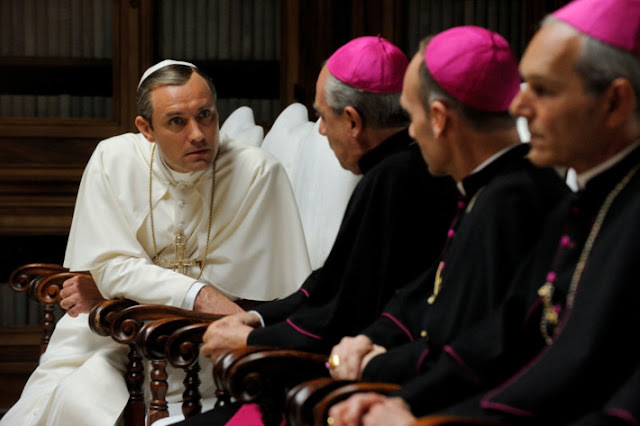 I predicted that Lenny (Jude Law) wouldn't so some overly progressive pope which many assumed solely based on the title of the series being focused on his age, but as for specifically what happens next, who the hell knows? That's exciting. - I think The Young Pope is just going to get better and better.